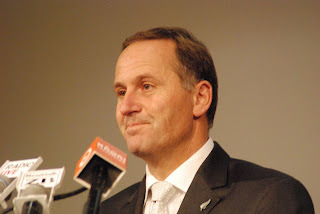 The New Zealand Prime Minister, John Key, has told media he stood by Foreign Affairs Minister Murray McCully’s insistence New Zealand had not dropped its travel ban on Fijian officials. "If Fiji wants us to move on the sanctions, then the answer is obvious: They have to move toward the holding of elections and the establishment of democratic institutions." McCully was due to meet with Bainimarama during the Sevens but rejected the offer when Fiji’s military-appointed President Epeli Nailatikau was sent in the Commodore’s place. But McCully – who is also Minister for Sport and Recreation – made no mention of Fijian Education and Sports Minister Felipe Bole’s attendance at a soccer conference in Auckland just days before. Bole attended the Oceania Football Confederation’s ministerial conference in Manukau on Monday along with ten other ministers from across the Pacific region. The Confederation’s website says the ministers discussed tax exemptions for sports facilities, more support for training sports journalists and waiving visa fees for sports teams and officials visiting Australia and New Zealand. The Ministers agreed to support further discussion at this year’s Pacific Islands Forum – a regional-wide organisation which suspended Fiji’s membership in May last year. A spokesperson for McCully said last week the Government reserved the right to waive the restrictions where it felt it was beneficial to the region. Key reiterated those comments today, adding he did not think the visit sent a mixed message. “The travel ban applies to those in the regime and the family of those in the regime: that means if they want to travel to New Zealand for a personal or private reason, as a general rule the answer will be no. Key confirmed the meeting could have taken place without Bole but said he felt it was appropriate for the Minister to attend. Make up your mind John Key! Is it sanctions for those in the illegal interim regime or not! You say the sanctions will be waived if it is beneficial to the region, so how is soccer beneficial to the region ahead of the Pacific Island Forum, which Fiji was banned from attending? Fiji needs NZ & AUS more than they need Fiji.